This church stands alone in the midst of fields. 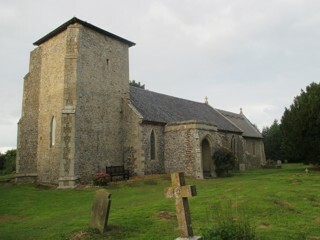 To access it start from Ridlington church and follow the Happisburgh/North Walsham road southwest. Turn left into Hall Road. You will shortly pass two or three houses on your left. Immediately after these houses, at the point where the trees end, there is a track on the left. This track leads to a gate at the southwest corner of the churchyard. The track is driveable with care and there is just enough room to turn at the end of it but I can give no guarantee that you are allowed to drive or park there, though I had no problem. The other access route, a track south from the main road then west on another track to the churchyard main gate, looked quite overgrown and I did not use it. The GPR holds 61 grave and 116 person records for the burial ground.